Antarctica is the coldest and windiest continent on earth. The environment is harsh and the weather can be unforgiving. At British research stations, temperatures can drop as low as -50 °C and wind speeds can reach in excess of 100 mph. In these conditions, it is important to be properly dressed! 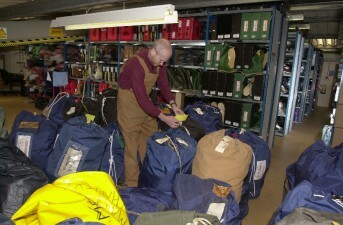 Here in the clothing store at BAS, all manner of clothing is issued to personnel travelling South. Safety is of paramount importance in the Antarctic. Being aware of the potential dangers that the environment can present is vital to safe operating not only for you, but also for your colleagues. Therefore all personnel travelling South with BAS must attend a Field Training Course in Derbyshire. This course covers such things as crevasse rescue, rope work, abseiling, jumaring as well as camping in the Antarctic and using Antarctic field equipment. 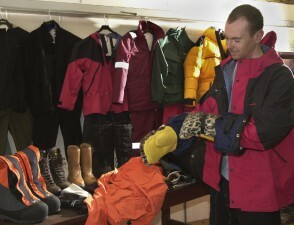 The course is designed to prepare you sufficiently to be safe in your work and at play during your time in the Antarctic.